For the first time in their brief existence as a franchise, the Golden Knights are facing adversity in the regular season. Obviously, when you’re playing Game 5 of the Stanley Cup Final and you’re down 3-1, that’s the essence of adversity in hockey. 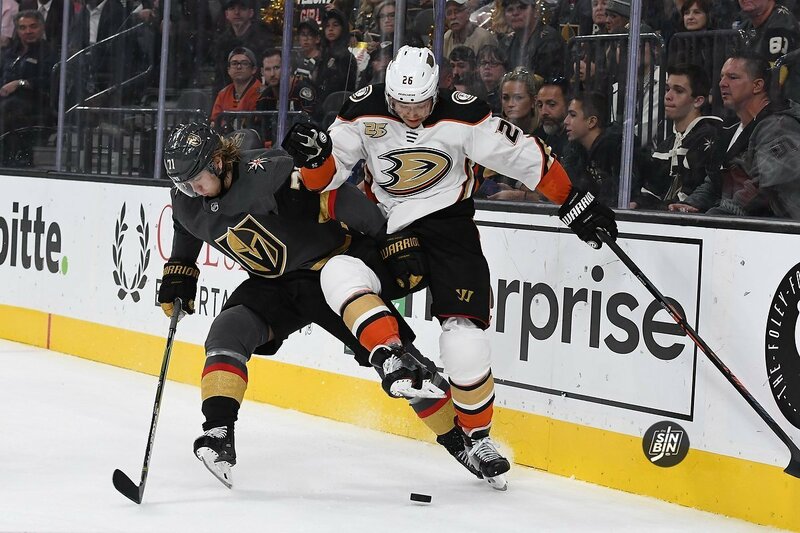 But after watching another failing performance Saturday, it’s clearly evident what’s wrong with this team, which has dropped four straight and last registered a point back on Jan. 19 when it beat Pittsburgh 7-3 at T-Mobile Arena. The Golden Knights need their best players to start playing like their best players. We’re talking Jonathan Marchessault. We’re talking William Karlsson. We’re talking Nate Schmidt. Yeah, this isn’t rocket science. The trick is how do you get these guys out of their collective funk? Particularly Marchessault and Karlsson. My flawed thinking was the return of Reilly Smith would get his linemates going. Instead, Gerard Gallant decided to put Valentin Zykov on the top line for Saturday’s game at Florida, relegating Smith to the third line with Cody Eakin and Brandon Pirri. So what happens? The Knights opt to not start the top line, going with the second line instead. They lose the opening faceoff, Shea Theodore collides with Paul Stastny, Aleksander Barkov skates in and beats Marc-Andre Fleury 12 seconds into the match. The top line was on the ice for the Panthers’ game-winner as Karlsson was unable or unwilling to pick up Mike Hoffman and he beat Fleury to break a 1-1 deadlock. A year ago, we were all talking about Karlsson winning the Selke Trophy, which goes to the NHL’s top defensive forward. lately, Pirri has been more of a Selke candidate than Wild Bill. In the Knights’ four-game slide, Karlsson has been kept off the scoresheet and he is a minus-6, including a minus-3 in Friday’s 5-2 loss at Carolina. He’s better than that and he needs to play better. And Marchessault is still in a funk. He has just one assist in the current losing streak. He is minus-8 over the last four and Saturday he managed just one shot on goal. The defensive lapses, I get. He will never be a Selke candidate. But one measly shot? Sorry, that’s not good enough. Not even close for a guy of Marchessault’s talent. I thought he was breaking out of the slump when he registered his hat trick against the Penguins and followed it up with an assist in the loss to Minnesota, a game which saw him register seven shots on goal. And he had nine shots against Nashville, even though he failed to gain a point. Of course, Juuse Saros stood on his head that night. Such wasn’t the case Saturday. James Reimer isn’t winning the Vezina Trophy any more than Marchessault is winning the Selke. He didn’t have to be great to beat the Knights because despite turning aside 34 of the 35 shots he faced, Reimer only had to be on top of his game a handful of times. It wasn’t as though the Knights had a ton of Grade A+ scoring chances that Reimer had to be sensational. As for the blue line, Schmidt has not looked great of late. He struggled Friday at Carolina and was less than stellar Saturday at the BB&T Center. Granted, he is usually paired against the opposing team’s top line and that has to be factored into things. But Schmidt, like Marchessault, is always honest about his own play and I’m sure if he was being asked he would admit he has to raise his level of compete. Gallant noticed all of this Friday and he moved Zykov up to the front line, then kept him there Saturday. It didn’t give Marchessault and Karlsson the intended spark, so it will be interesting to see what happens Tuesday in Tampa. I’m still not sold on Zykov. In fairness to him, he has only appeared in three games so his sample size is relatively small. He doesn’t appear comfortable out there, regardless of which line he is skating on. He has been hesitant to shoot (five shots, no points) and he defers too much to his linemates as he obviously wants to fit in. I’m also not sure how great a skater he really is. Perhaps conditioning is a factor. He didn’t play badly Saturday so to lay the blame at his feet certainly wouldn’t be proper. But he didn’t get his linemates going, which was Gallant’s intent by playing him with Marchessault and Karlsson. This is Zykov’s fourth NHL organization. He was drafted by Los Angeles, let go by Carolina and Edmonton. So something is not right. If one team whiffed on him, I’d understand. But three? Apparently George McPhee sees something in this guy that I don’t so I’ll give GMGM the benefit of the doubt for the moment. As for Smith, he didn’t look all that steady and comfortable playing with Eakin and Pirri. I think given time they could be a formidable line. But Pirri is slumping as well (zero points in his last five games) and while Eakin is doing good things for the most part, he has just one assist in his last seven games. So you can see Gallant’s dilemma. He’s trying to re-ignite two of his four lines and so far the pilot light isn’t on. Perhaps this is where the Knights are missing Erik Haula. They’re not tilting the ice on opposing teams the way they did last year. Haula is one of the team’s fastest skaters and can create transition on his own. And Will Carrier also brings speed to the lineup though his speed is more conducive to the forecheck than to just out-leg someone with the puck through the neutral zone. But with both of those players out, the Knights are still sticking to what is their identity. Unfortunately for them, teams have figured out how to slow them down, if not shut them down. And when you’re trying to play a speed game on crappy ice surfaces like at Carolina and Florida, it’s going to work to your detriment. When the Knights kept things simple, played dump-and-chase hockey and used a strong forecheck, they generated more opportunities. And when you play on the road, simple is always better. Normally, sitting a Marchessault or a Karlsson for a game might help them loosen their grip on the sticks and help them relax. But that’s not happening, especially given who Tuesday’s opponent is. And the team just had eight days off, so everyone should have been rejuvenated, in body, mind and spirit. Maybe a long walk along the beach might help. Maybe moving Smith back up to the top line is the answer. But a turnaround is needed now, not later. The team’s best players need to get back to being the leaders. The Knights still have an eight-point lead over Vancouver for third place in the Pacific Division. But someone once said of hockey, “This game is slippery … it’s played on ice.” The Knights better be careful they don’t let their postseason plans slip away from them. Great article Steve. Haula is missed. 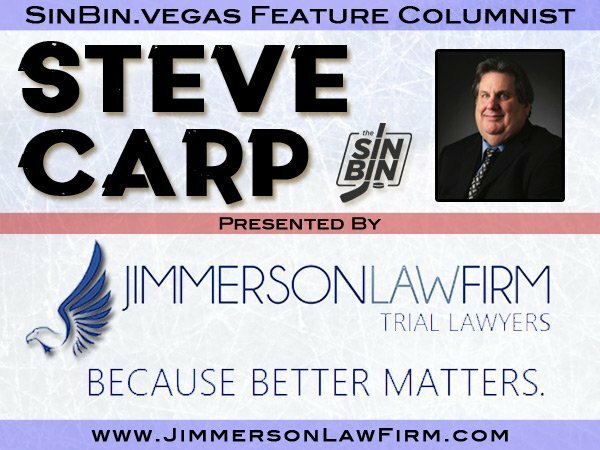 Carrier as well, since his speed draws penalties on L4 giving the team more PP opportunities. 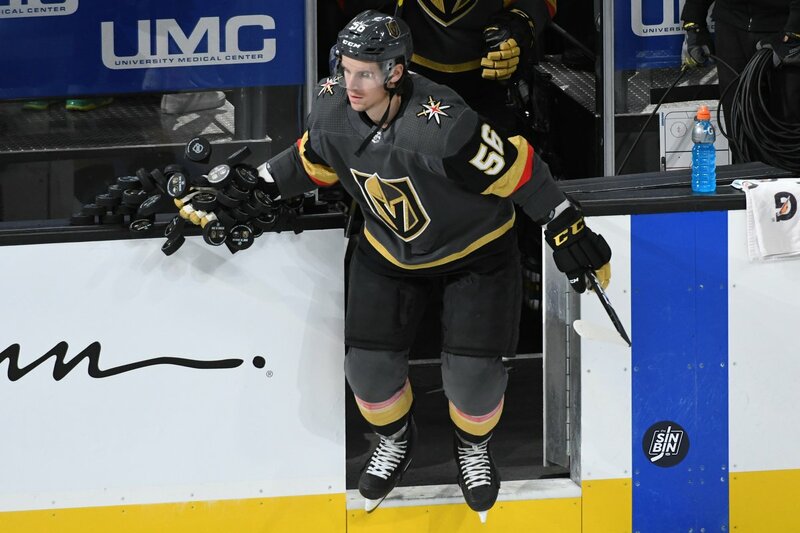 Zykov appears unsure of himself at times, but I think in 3-4 more games with some consistent action we will see what he can add. He has had some very good moments. Reminds me of Tuch earlier last season. He outweighs Reilly by 35-40lbs so he’s a bigger net front presence with excellent hands. If they don’t see F improvement on L1 & L3 in the next 2-3 weeks they’ll probably have no choice but to look outside before the TDL. – Giving up goals within a few minutes of scoring. – Giving up goals late in periods. – Losing critical face offs. – Letting teams cycle for what seems like 10-15 consecutive passes. – Too many odd man rushes. – Not much hitting by the forwards besides Reaves. Need Carrier asap. Other teams don’t fear us right now. – Horrible entries into the offensive zone resulting in easy turnovers. – Power play passing not up to snuff. Difficult to watch other teams PP with lots of nice passing. Also losing the initial face off on the PP is resulting in 30 seconds lost. – Losing battles all over the ice. – It was evident from game one that the top line is not the same as last year, and I wasn’t expecting the line to be +40 again. However, other teams top guys seem to be more aggressive and faster, while our top guys no longer put two passes together. They seem to be lacking the drive this year. – Not listing hitting posts and crossbars, refs getting in the way, broken sticks and our guys crashing into each other as these things happen. Seems like these things are happening way too often. These are just some annoying things, and some can be corrected. Let’s hope our boys can peak at the right time. Let’s hope no stupid trades are made, but I’ll take McDavid…please. Great analysis play hockey and forget all this #1,#2 line crap. Forecheck,hit,get people to the net and quit trying to make so many passes. Someone needs to step up and be the leader to motivate and lite a fire under them because obviously Gallant is not getting through.